Has Hezbollah Co-opted the Western Media? Putting aside more conspiratorially-minded critics of the mainstream media, genuine practical concerns and mounting evidence suggest Western media has been co-opted by Hezbollah in Lebanon to a significant agree. So much so, in fact, that it may be unable to paint an accurate picture of the current conflict. 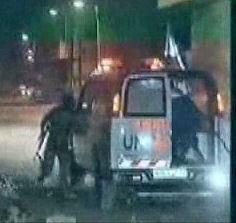 The two year old image at right is from a Reuters video of Palestinian terrorists escaping from an action in Israel with the aid of a UN van. Video here. The decision by America's MSM not to publish it at the time may represent press bias, or that its concern for American's right to know is somewhat selective. However, it also serves to make another important point. Service organizations like the UN and the Red Cross often rely on local individuals to flesh out their staffs. Obviously, there are areas of the world where it's difficult to tell the good guys from the bad and sometimes the bad guys may represent the majority of the local population. Such may be the case in Southern Lebanon and it invites the kind of co-optation witnessed above. With the MSM having decided to rely heavily on local stringers in covering the Israeli Hezbollah conflict in Southern Lebanon, their coverage appears to have fallen prey to manipulation by a terrorist group, or at least its propaganda machine. The following examples represent instances where that isn't simply speculation; it appears to be true. In this post by Michelle Malkin you'll find the July cover of US News and World Report depicting a fire in a dump outside Beirut. The story implied the destruction was caused by an Israeli air or artillery strike. Time reported the fire to be the result of a downed Israeli jet. Neither of those versions seems true. From this video of the incident, we learn that the fire was the result of a Hezbollah rocket targeted at civilians in Israel before it was intercepted by Israeli defensive measures, falling back to earth. And we learn more, too. The images provided by the stringer for the false reports show he was in close proximity to the fire. There were six or more photographers crawling all over the site. 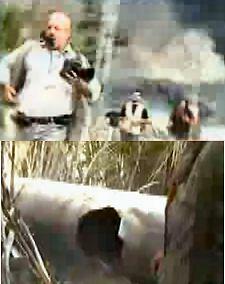 (top left) Witnesses at the site obviously knew this was a downed Hezbollah rocket (bottom Left). But evidently that information was never passed along in a caption, or any other additional context for the images, which found their way into the Western media. It doesn't take a conspiracy buff to ask the question, why not? A second troubling development involves the alleged targeting of two Red Cross Ambulances by the Israeli air force. Detailed coverage of that event can be found here. In essence, several versions of the story were told by the primary individual said to be involved and the more coverage the story received, the more the versions changed. Only through searching far and wide on the Internet, would one be likely to find this video, which includes the following quote: "Because of the extreme dangers of the roads, journalists have not visited the scene. These pictures were taken by a local amateur cameraman." Consequently, an ambulance with damage more rusty, than recent, said to have contained an ever changing number of individuals, and with decidedly different versions of their wounds, made its way around the world as fact established by the MSM, when no acknowledged journalist had access to the vehicle at the time of the original report. Such standards of verification wouldn't pass muster at an adequate college newspaper, yet numerous publications, including the New York Times, have either featured or mentioned the story in one of its differing versions. And the above doesn't even begin to address events in Qana. Simply scroll down to the second video here and you'll see that the most visible individual during the bulk of the coverage of Qana has been discovered to be akin to a field director for Hezbollah media-distortion machine. Yet, still the AP would have us believe that many of the images out of Qana couldn't possibly be posed. For another detailed analysis of Qana, you might also see this report on my own blog. Certainly the media faces significant challenges when trying to accurately portray a conflict, or an all out war. Competition in their business today is keen and the bottom line, as well as image, drive media outlets to constantly produce interesting news. Unfortunately, at a time when the average individuals trust of the media is less than good and dwindling, coupled with the advent of alternative media, large media operations are likely doing themselves even more harm by appearing to have abandoned the dedication to veracity required for any news media to be objectively thought of as truly good.